Diabetes is a serious health problem that threatens humans as well as cats and other companion animals. Complications from this condition arise from the victim's inability to process glucose. The scope of the symptoms depends on the severity of the disorder, but there are common warning signs owners can look for. The most common symptom associated with feline diabetes is a marked increase in the cat's desire to drink and urinate, according to the University of Illinois College of Veterinary Medicine. Since diabetic kitties can't process or use glucose properly, the molecule accumulates in their bladder and bloodstream. The presence of glucose in the urine causes your cat to expel more water when he relieves himself, which forces him to drink more to compensate. Glucose also encourages the growth of bacteria, so felines with diabetes also are more likely to develop urinary tract infections. The concentration of glucose molecules in your cat's brain is a key factor to regulating his desire to eat. 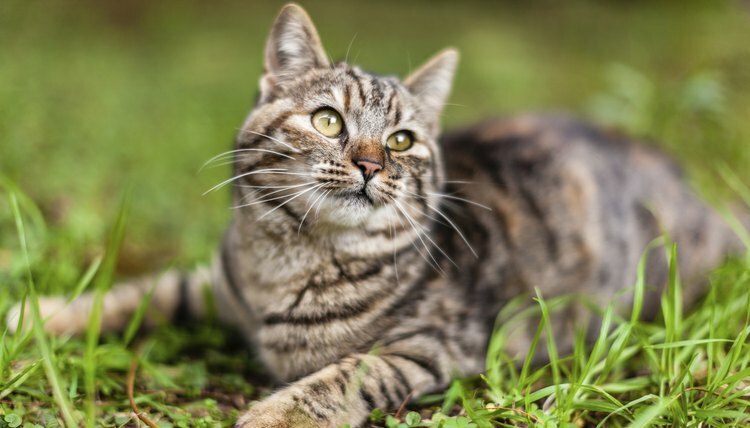 Since diabetes interferes with sugar levels in the bloodstream, drastic changes in appetite are likely in cats suffering from the disease, according to Washington State University College of Veterinary Medicine. This change in appetite may lead to short-term weight gain, but the pounds eventually fall away as your kitty's condition worsens. The malnutrition associated with diabetes increases the risk of skin infections, eye problems and other health issues. Ketosis, or ketoacidosis, is perhaps the biggest danger associated with feline diabetes. As glucose builds up in a diabetic cat's bloodstream, the sugar molecules begin to decompose into toxic biological chemicals called ketones. This transformation leads to a variety of serious and alarming symptoms, and may be fatal if left untreated. Common signs of ketosis include diminished appetite, digestive distress, muscle weakness and breathing abnormalities, according to Cornell University College of Veterinary Medicine. Cats diagnosed with ketosis are given emergency intravenous treatment to stabilize insulin and water levels. While diabetes is a serious disorder with potentially fatal consequences, it is not a death sentence for your pet with the proper treatment. In most cases, the symptoms can be managed with regular doses of insulin administered through injection or as an oral medication. Your veterinarian will recommend changing your cat's diet to a diabetic-friendly food and he also may ask you to give your cat scheduled meals rather than allowing him to "free feed" throughout the day. Some cases of diabetes are actually the result of another disease or injury, in which case treatment depends on resolving the primary condition.